If you love a game of golf but are bored of your usual club, this rather unusual 19th hole could be just the thing you've been looking for. 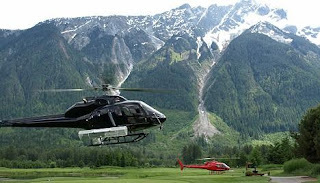 Located at the top of Mount Currie in Whistler, Vancouver, the lofty site is situated 8,000ft above its nearest competitor, the Big Sky Golf Club in the Pemberton Valley. 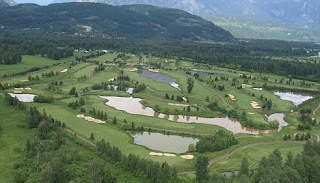 The site of the upcoming 2010 Winter Olympic Games, Mount Currie is 8,000ft above the Big Sky Golf Club in the Pemberton Valley. 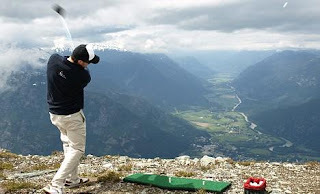 If you take up the £290 offer, you'll be flown to the top of the mountain by the Four Seasons Resort to practice your drive with biodegradable golf balls. PR officer Samantha Geer says: 'It's a great attraction that has brought a lot of interest and a different experience to our guests. 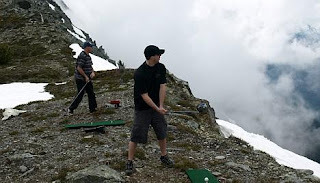 Don't delay in booking your spot, though, because the 19th hole is only offered from May to October.